Our coronagraph is designed specifically to operate within the 1.6 arcsecond radius from the star and as close as 0.2 arcseconds. In this region, we predict sensitivity to objects 14 magnitudes (nearly a million times) fainter than the primary star with a relatively short exposure time. These images are made with near-infrared light (H-band, wavelength 1.6 microns). The Lyot Project covers an angular region completely inaccessible to any instrument currently available or planned for the Hubble Space Telescope. This angular field of view around the stars we will observe corresponds to approximately the same size as our own solar system. Thus the Lyot Project will be probing nearby solar systems with a sensitivity that has heretofore been unavailable. A qualitative appreciation of what this means is shown in the set of two figures below. Both panels show adaptive optical coronagraphic images of a hypothetical nearby star. Both images are scaled to the same brightness and represent similar exposure times. 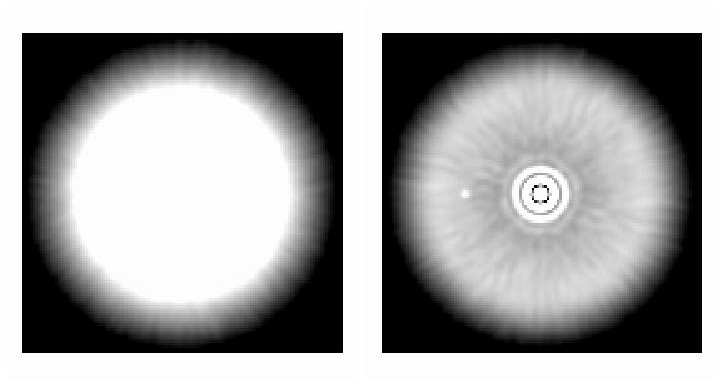 On the left is an image made with a telescope identical to the AEOS telescope, but with an adaptive optics system with only fourth of the number of correcting elements, or actuators on the deformable mirror. On the right is the image achieved with the AEOS telescope, its existing adaptive optics system, and the Lyot Project coronagraph. This is a qualitative comparison between a hypothetical, low-order adaptive optics coronagraph (left) with the predicted performance of the Lyot Project Coronagraph (right). Each image measures 4x4 arcseconds. In the case of the Lyot Project, the halo of light around the star is partially cleared to a radius of 1.6 arcsec at an imaging wavelength of 1.6 microns (the so-called infrared H band). This permits the detection of much fainter objects next to the central star. The key to the success of the Lyot Project is the AEOS adaptive optics system, which has 941 actuators embedded in its deformable mirror. This enormous increase in actuators enables the clearing of the halo, as seen in these two images. The image on the left represents a system with only about 200 actuators in its adaptive optics system. In order to detect faint companions around nearby stars, careful consideration has been placed on the sample of stars which the Lyot Project will survey. By incorporating factors such as observing time and the expected frequency of companions, we have selected 300 stars within 20 parsecs which are brighter than 8th magnitude. (The AEOS telescope requires stars at least this bright in order to correct the images with adaptive optics.) The Lyot Project coronagraph is sensitive enought to detect any brown dwarf companions to the surveyed nearby stars, and exoplanets larger than 5 Jupiter masses in largely unexplored regions around local stars. 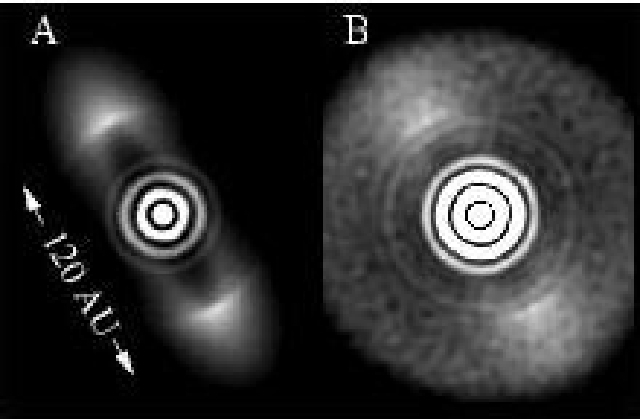 Images of two simulated debris disks (3 x 3 arcseconds in size, as seen in the H band or at a wavelength of 1.6 microns), illustrating the detectability of dust on solar system scales using the AEOS coronagraph. The image on the right represents a disk very much like the one found around the star HR 4796A. The image on the right represents a disk that has 100 times less dust than the HR 4796A disk. It is clearly visible, meaning that much sparser dust disks than have ever before been imaged will be accessible to the Lyot Project Coronagraph. The coronagraph will also provide extremely sensitive imaging (nearly two orders of magnitude more sensitive than the NICMOS coronagraph on the Hubble Space Telescope) of any dust debris disks around nearby stars. Most of the debris disks imaged so far are believed to be atypical, in that they contain far more dust than the most common disks. This increase in sensitivity, through the Lyot Project's coronagraph, permits imaging of disks that are typical, with up to 100 times less dust than those which have already been observed. This is important for understanding planetary formation in general and even for detecting planets amongst the dust. In addition to surveying the 300 target stars, the Lyot Project will be able to play a key role in follow-up high-resolution imaging of stars thought to contain disks from images taken by NASA's recently-launched Space Infrared Space Telescope Facility (SIRTF).